Allan and Dorothy Johns first bonded together as locals on the Mechanics Hall dance floor. Both share a love of ballroom dancing and were never far apart even as children. Allan grew up in Balnarring and Dorothy lived in neighbouring suburb Hastings. Some fond memories of Frankston include the picture theatre, Olivers Hill and many a school dance! They say the greatest adventure together is having children and being married for 54- years. Their secret to a long- term marriage is to stick at it and you have to go without things to have children. Allan says it’s a partnership, we never go anywhere without each other, she gets annoyed sometimes, she says I’m going out and I say where we going. 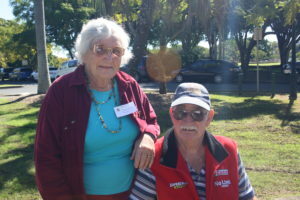 Interviewed at the Frankston High School reunion in New Farm Park Brisbane July 2012.